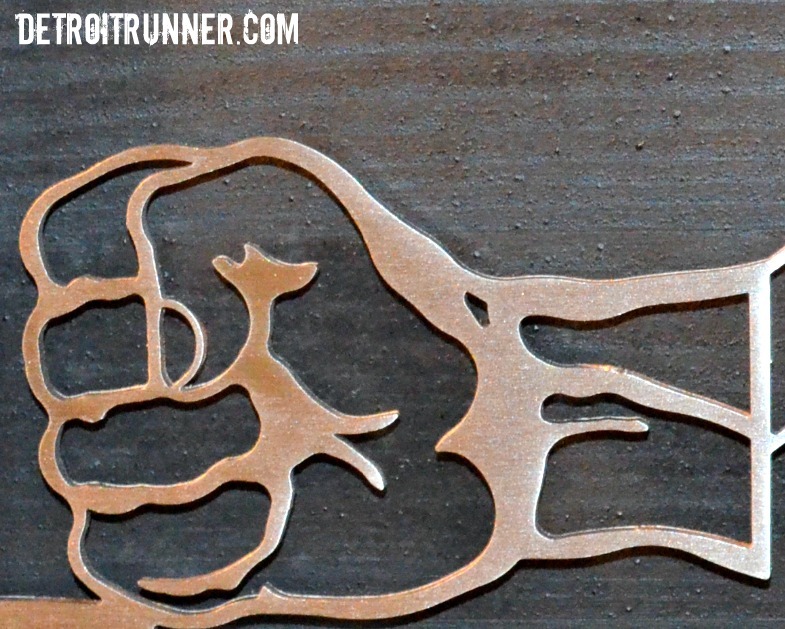 As all of you know, I love my race medals. For me they are a great mimento of the races I have accomplished. I did a review back in January for an Allied Medal Display that they made for me(full review HERE) Because the display was getting full, I decided to contact the company again in order to have them design a custom Cityscape for my city - Detroit, of course! They have designed many other cityscapes. 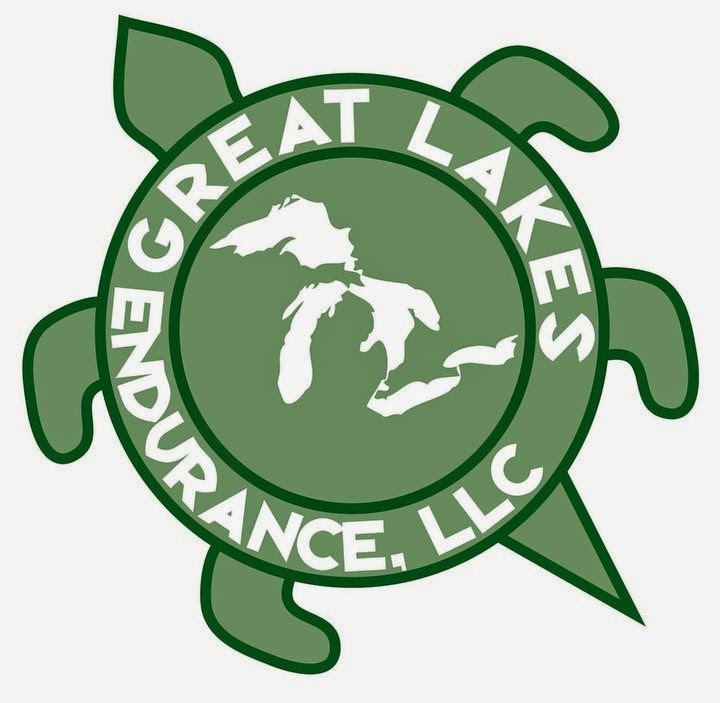 I e-mailed Joel over at Allied Medal Displays to let him know the basics of what I was looking for but really left it up to them to design it and then I could make adjustments if needed. Based on all the designs I've seen on their website, I knew I was in good hands. I also requested a three level medal display so that I could really load this display up as time goes on. The three level design comes with clips so you can space out the medals up or down in order to see them all. A great idea to make the display unit even more customized and so you actually see every medal. One thing you will notice is that I decided this time around that instead of mounting the display directly to the wall, which is how I have my other display, I painted a piece of wood black and added the medal display to the wood. 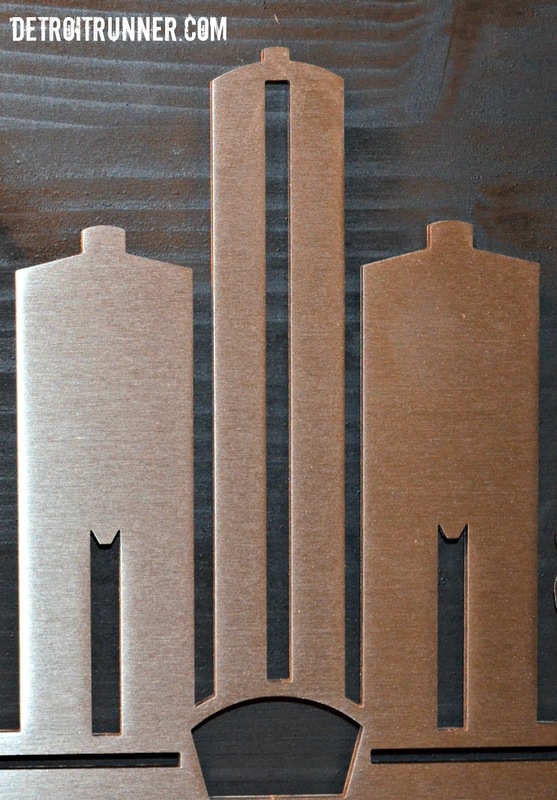 It was about a $20 to add that and I did this myself as Allied Medal Displays specializes in metal. Since it's a custom display, I figured it would give a nice custom look as well hanging in my den. In addition, with the color of the stainless steel, it really pops out on the black background. Of course, like their other displays, this one is super easy to install and comes with easy directions. Literally, it takes about 10 minutes to install it with the screws and wall spacers provided. 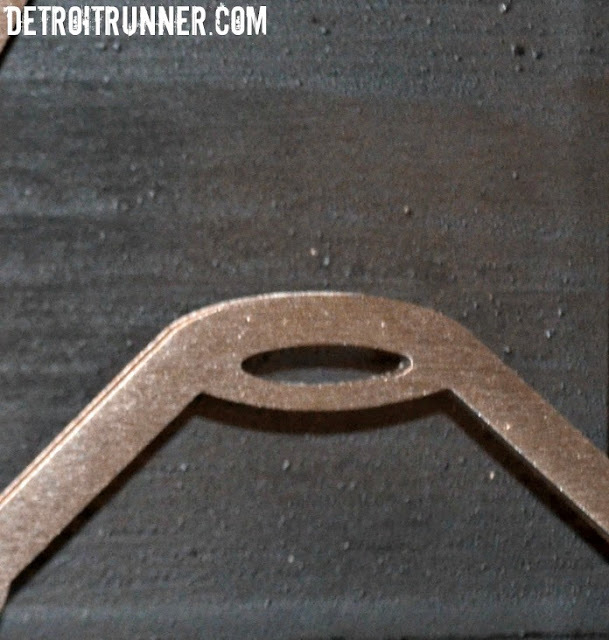 You need spacers so that you can easily slip the medal ribbon on the display unit. 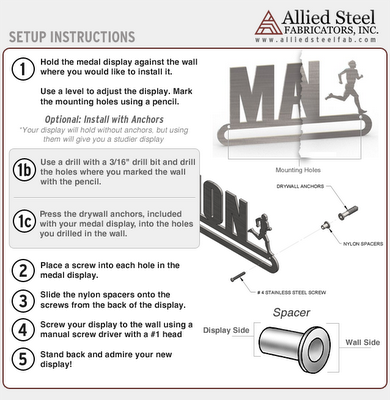 Here a look at the directions that come with the display unit. Mark, drill, screw, use - it's that easy! Joel is super easy to work with and he's really concerned that they produce a display that is exactly as you requested. Fortunately with computers these days, they can design something and change it fairly easy so you get to see what will be delivered. There is no surprises and no disappointments here because what you see is what you get. Here's a few close up photo's of the display. It gives you a great idea of the quality that they put into their products. I will also note that you need to be careful when handling the display because it is quite sharp on the edges but completely worth it for the level of detail. And of course, a car!!!! The Motor City! As you can see from the pictures above, the level of detail in the design is incredible and precise. The design staff at Allied Medal Displays can handle anything you throw at them -- well, anything I asked. If you can dream it up, then they can make it. The landmarks on the display look just like the actual landmark. 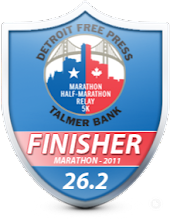 That being said, I decided rather than just talk about the medal display, I'd also show you what the design is based on. 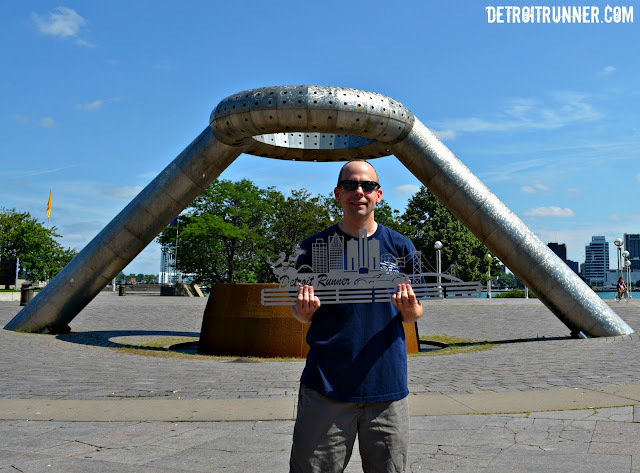 I decided to go to Downtown Detroit, along with my son, and take some photos of the Allied Medal Display I received with the actual landmarks. 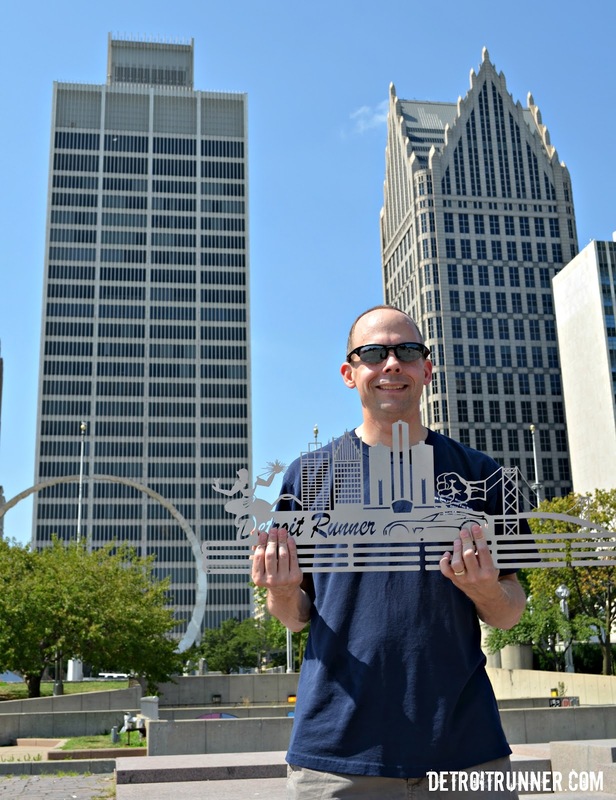 We basically did a downtown photo shoot together for the review and had a great time. Moving left to right on the display, the first landmark is a large bronze statue called the Spirit of Detroit. A couple quick facts. In its left hand, the large seated figure holds a gilt bronze sphere emanating rays to symbolize God. In its right hand, is a family group symbolizing all human relationships. The next item on the display is the Horace E. Dodge and Son Memorial Fountain in Hart Plaza. This fountain is a focal point in Hart plaza. Since it was 90 degrees when we took the pictures, it would have been nice to see this working. I'm not sure why it was not. Horace Dodge(as in Dodge cars) was obviously a significant gentleman in the auto industry and his widowed wife donated the funds in 1978 to build the fountain. The third and fourth item on the display is of the One Woodward Avenue building and the One Detroit Center Building. Two of many buildings in Detroit's Skyline. These buildings were built in 1963 and 1993, respectively, and both are in the heart of the financial district of Detroit. One Woodward was designed by Minoru Yamasaki and he used elements for his design for the now destroyed World Trade Center. Notice the resemblance? One Detroit Center is the largest office building in Michigan and the second tallest overall behind the central tower of the Renaissance Center. Speaking of the Renaissance Center, that's the next landmark on the cityscape display. The Renaissance Center, built in 1977, houses a Marriott Hotel(in the middle tower) and is also the headquarters for General Motors along with numerous other businesses. There is actually seven buildings that make up the RenCen but these three are the most significant. In addition, the middle tower is the tallest building in Michigan and including all buildings is 5.5 million square feet of space - amazing! The next landmark on the display is the Monument to Joe Louis, also known as "The Fist"
This was not originally on Allied Medal Displays design but I asked it to be added since it's such a well known monument in Detroit. Actually, the original design that Allied Medal Displays gave me had two additional buildings in it's place and looks phenomenal. See it below. This is what was e-mailed to me so you can see there is no chance in getting something you don't want. "The Fist" represents Joe Louis' power of his punch both inside and outside the ring. It was dedicated in 1986. 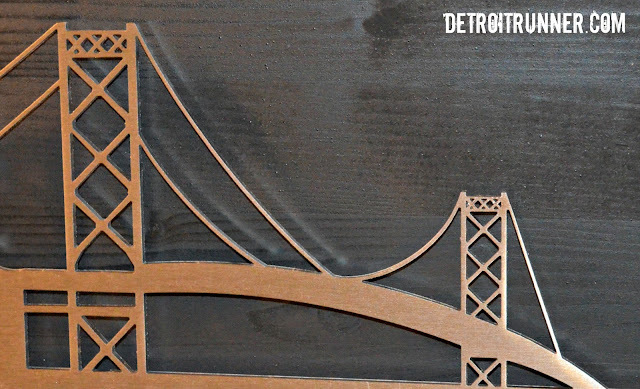 The next landmark on the display is the Ambassador Bridge. The Ambassador Bridge, a suspension bridge, is one of the gateways to Canada. This bridge takes you into Windsor, Ontario. Open in 1929, at the time, it was the longest suspended central span in the world at 1,850 feet with a total length of 7,500 feet. It's also the busiest International Border in terms of trade volume today. 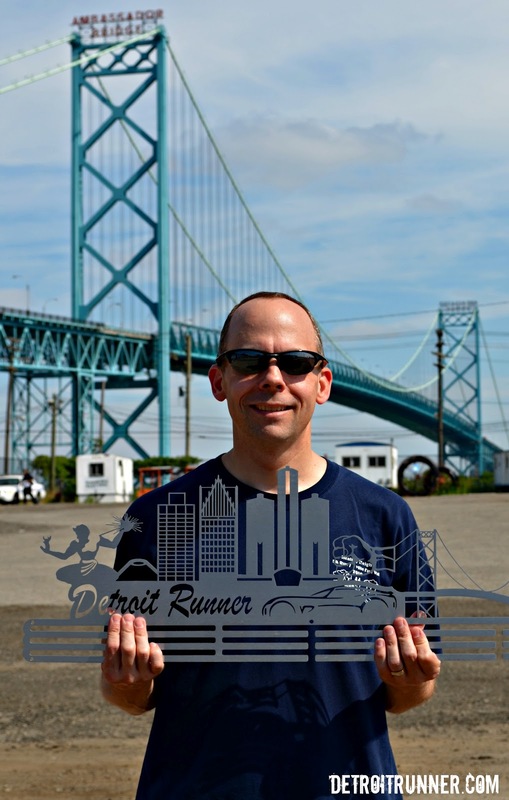 Even more exciting is the fact that if you run the Detroit Marathon, as I have, you get to run across the bridge into Canada and then run back through the tunnel into the USA. The last item of note on the display is the car. The ultimate American car -- the corvette. 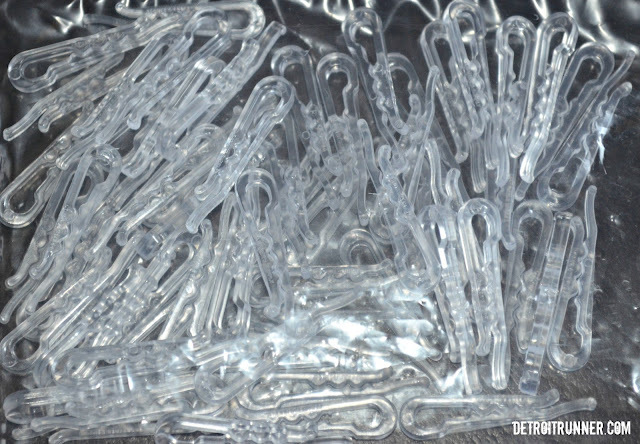 You must think of cars when you think of Detroit, don't you? Again, I would highly recommend working with Allied Medal Displays whether it's to purchase one of their standard displays or you want to have them design something special for yourself or for someone you know. This would make an incredible gift for any runner that races and prices are very reasonable. 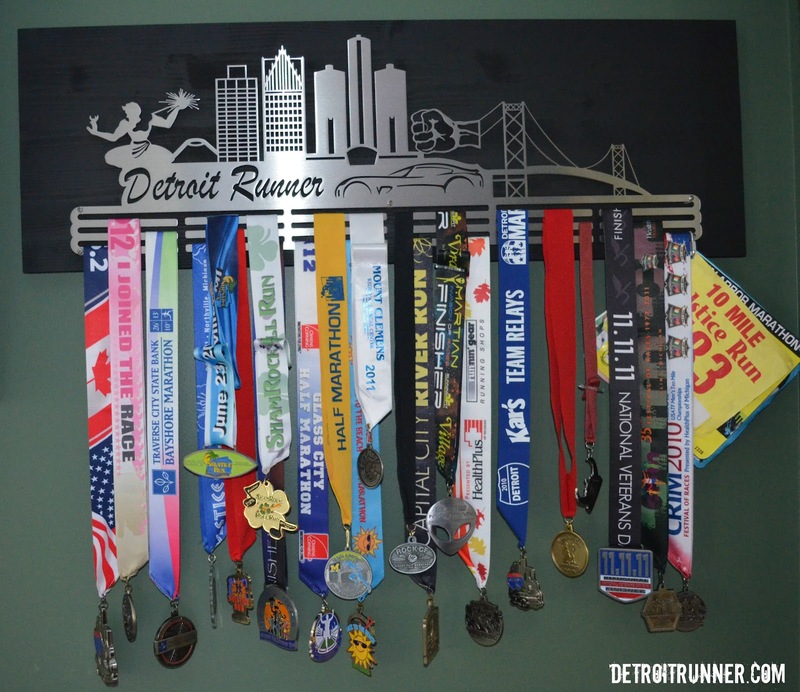 Don't just have your medals laying around - display them proudly! You won't be disappointed with one of these great displays. This is every single medal that I own along with all my running bibs and it's not even close to being full. This is going to last me for many years to come. This display is completely impressive, don't you think? I want to thank Joel over at Allied Medal Displays. After we went through the design process, he offered to send me the display unit in exchange for this review. I was completely surprised and it's very much appreciated. I had not intended on that. 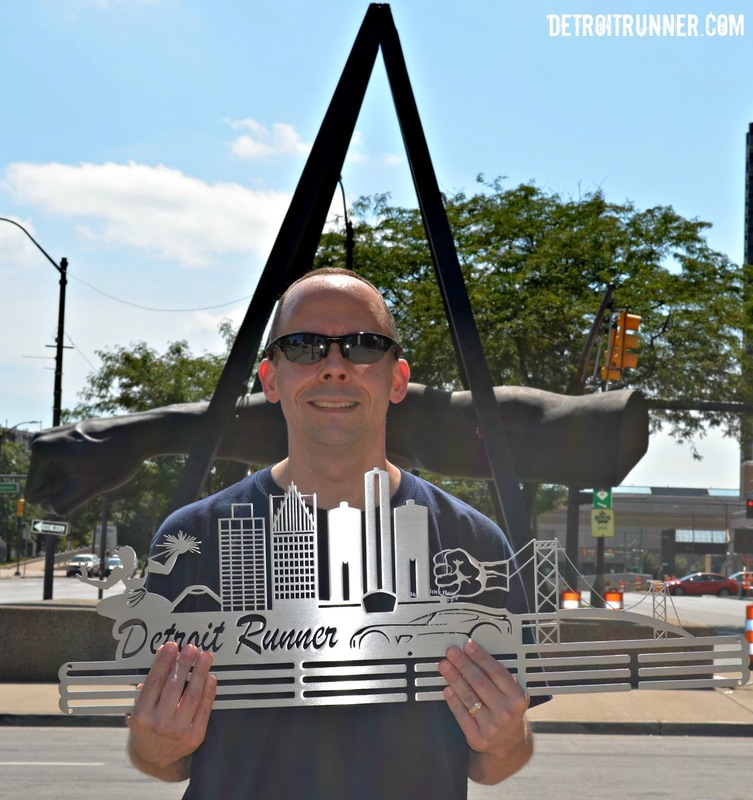 I also want to thank my 12 year old son since he helped go around downtown Detroit with me. He took all the pictures I'm in! Not bad for a 12 year old. Amazing! 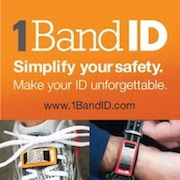 Interested in getting one yourself? There's lots to choose and they should have a Detroit cityscape available on their website soon similar to this display. It's just a little less custom and a little shorter/smaller. I've see the design but I won't spoil it by posting it here but will say it's equally as impressive and should be up on their website very soon. Go to their website, HERE, to see more information. Go to their Facebook page, HERE, especially because they are always running contests/specials/updates. Like their page and you'll get all the information from them going forward. * Note - I received a complimentary custom medal display in exchange for this review. All opinions on this blog post are my own and I was not paid or required to give a particular opinion on the display unit. I'm jealous.... That is one freakn' sweet medal display!! I LOVE IT! I think the only thing I would change would be the corvette to a Ford Mustang, but that is just because we are a Ford family. 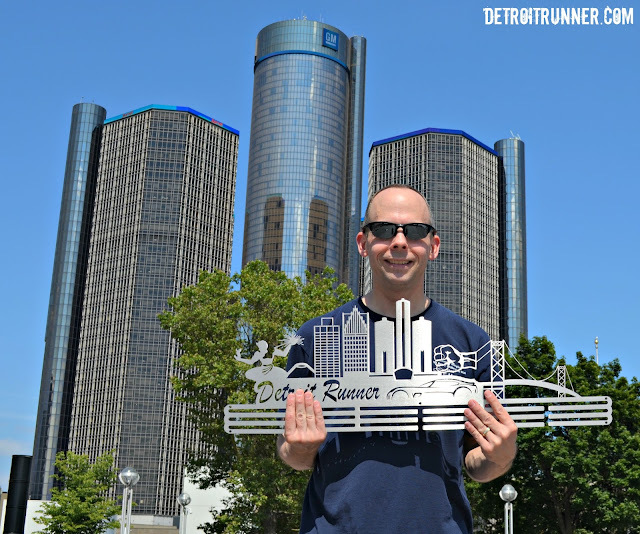 It makes me super excited to come back this fall for the Detroit Half. I really like how you mounted it on black. It really pops. Also, in my case, we know we are only here a few years, and I will need to remove mine from the wall, and will need more anchors for our next place. If I mounted it to wood, then I could use more standard picture hangers to secure it to the wall. I also really wish the option to do multiple rows was available when I got mine. I wonder if there is a way to buy just a couple extra rows to either mount underneath or attach to it somehow? I will need to ask. They have add on hangers on their site. Also you can easily move the hanger. Just buy new drywall anchors and you are good to go. Looks awesome! I wonder what a custom make of the TC would run me. I will definitely think about this once I get more medals. That is very nice and looks really good! You are very lucky! Love the display! 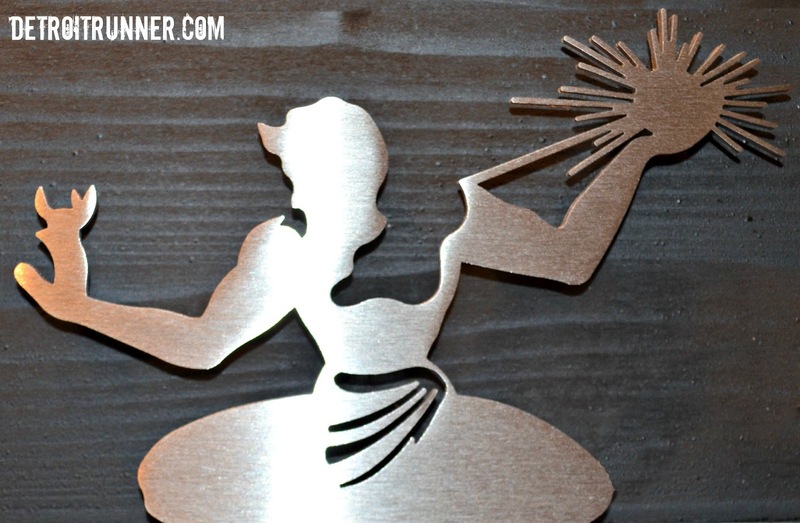 Allied Metals does a great job and made custom ones for me, hubby and the kids! Didn't know they had hangers though, I will have to look into that. That is an AWESOME medal rack. AWESOME. That is so awesome!!! I am totally jealous! Jeff, that is amazing! 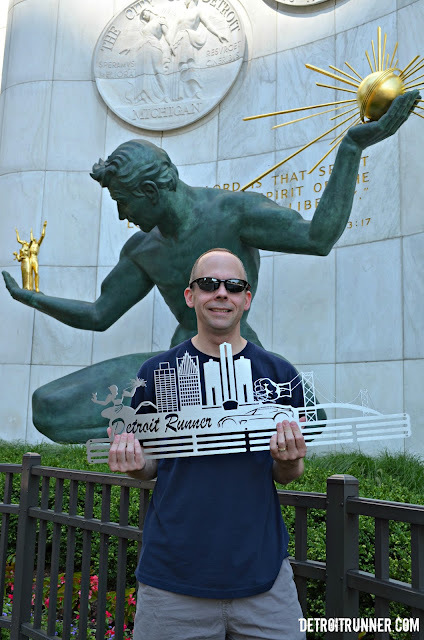 I love the spirit of Detroit!